Today we woke up in the misty backyard of the Mangamuka Dairy. We were able to enjoy a cozy breakfast of bacon and egg croissants coupled with some apples we had purchased the night before. The hot breakfast took somewhat longer than we had anticipated to prepare, and we were a touch lackadaisical getting on the road at 8:45, but we made up for time by cruising up the road to the start of the Puketi forest. 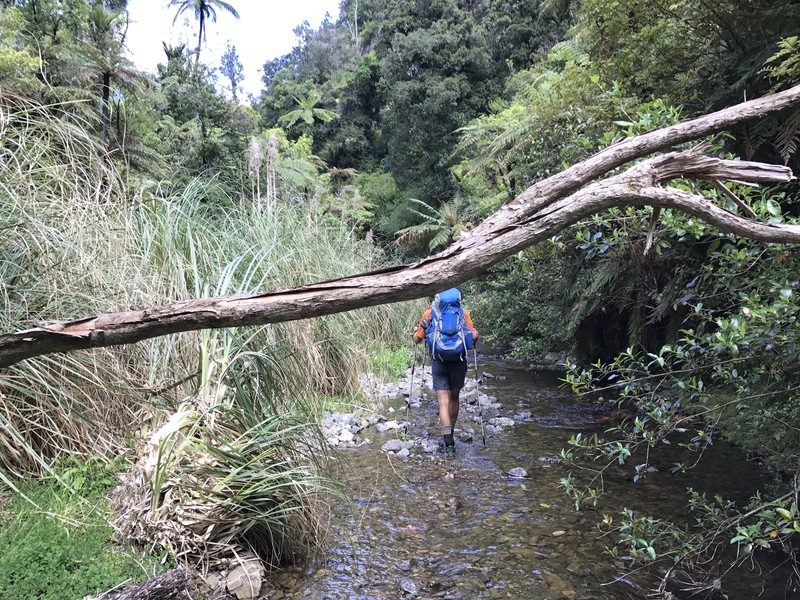 The Puketi is actually pretty lovely, especially in contrast to the Raitaia forest, which felt more like a muddy dare to slip and fall either on your way up or down a steep and muddy decline. Much of the Puketi was spent walking on ATV track, which though not entirely scenic, was easy enough walking and we were able to make up even more time. We had a quick lunch at the base of a small bridge, where a stream burbled underneath (note: we had been informed that had the stream been high enough as to flow OVER the bridge, we were advised to not proceed to the gorge, out of fear of flash flood). Once we reached the gorge, the water levels in the stream were incredibly reasonable, and we were able to walk the ~4k with the water never really reaching above lower thigh level. The walk was really gorgeous, and the cool flowing water helped to clean out some of the more stubborn hunks of mud that had caked our socks and shoes. After our river walk, we went up into the winding hilly track, that was very fun to walk, though pretty difficult. If it had been raining, the mud along the ridge would have made the walking incredibly treacherous. Will ended up actually having to say goodbye to one of his ultralight poles, as one of them snapped as he tried to steady himself along the sketchy sideways incline. Finally, after a substantial bit of walking, ankles tilted, along the treacherous ridge line, we camped in a nice cozy spot along the trail, with great access to the water. Enjoyed a full delicious meal of couscous, where we decided that the pasta would be playing a key role in future outfitting. Tomorrow we’ll make our way out of the forest, and on our way in the direction of Kerikeri. You all are amazing, and this Mimi is loving being able to follow your progress! Keep it up, you are getting your rhythm and making memories of a lifetime. Stay safe! Love to Jack!